1 day (Friday afternoon) Reception of the group at the bungalows in the area of Kaval tepe at the dame lake "Shiroka Poliana" shore. Accommodation in the waterside bungalows, equipped with WC, hot water supply, living room, balcony, TV set. 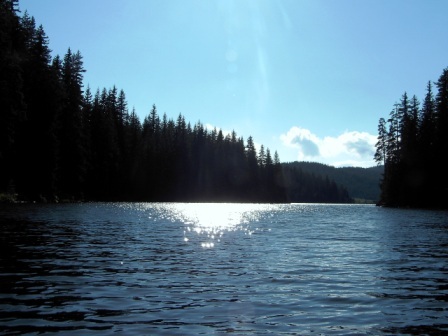 2 day (Saturday) A boat trip and fishing around the beautiful bays and islands of the dame lake. (The boat and its captain are at your service 24 hours). Possibility for lunch/dinner picnic at spots on the dame lake shore specially selected for the purpose (out of the package's price). 3 day (Sunday) A boat trip and fishing in the dame lake. After lunch: departure of the group. • Two overnights in coastal bungalows at dame lake Shiroka Poliana in the area of Kaval Tepe, equipped with WC, hot water supply, living room, balcony, TV set. The price of one bungalow for 4 people is 31 €/night, for 6 people – 52 €/night. • Rent for a motor boat with 5 seats and life vests, with a professional captain. The boat is at your disposal for Saturday and Sunday. • Transportation to and from the camping. • Food: There is a restaurant-cafeteria in the camping. The kitchen works on preliminary request. • Rent for a tent, reclining chairs, tables and bivouac equipment. • Food: BBQ, bred, salads, appetisers, desserts, coffee, tea, 100 ml of liquor per person (to be negotiated ─ Bulgarian grape brandy, vodka, gin), 1 bottle of wine for 4 people (to be negotiated), 1 beer or soft drink per person (the brand to be negotiated). • Children below 16 years of age use 10 % discount of the price of the picnic. • Qualified personnel, which will take care of the catering. • Degustation of four kind of wine with appropriate cheese and appetisers. • Rent for fishing equipment and bites. A lunch picnic at Shiroka Poliana dame lake and view to the picnic bay.